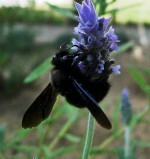 At least one trip to La Janda during the winter months has become an essential part of the wildlife outing calendar for my friends and I, and is one we all look forward to. 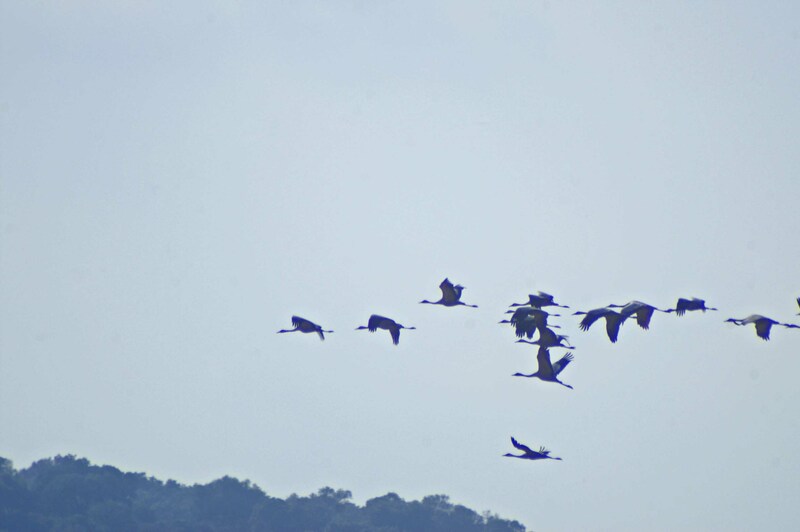 For us, one of the main draws there is the Common Cranes that begin to arrive here from the end of October, staying through till late February-March. The winter landscape of La Janda is dynamic, varying mainly according to weather conditions, and every trip we have made there has been quite unique and different from the last. We took a bit of a detour on the way to the wetland site this morning as we had been told that there had been sightings of Little Bustards in the fields off the main road back before you reach it. We drove up there very slowly, and had a thorough scan around with a ‘scope, but with no luck. We did have a great view of a Buzzard perched up on a fence post and a Kestrel hovering almost over our heads, but with no apparent Little Bustards we were impatient to get on our way. Inside the site, on the first stretch of track we had sightings of flocks of small birds; Serin, Chaffinch, Meadow Pipit and Goldfinch were all accounted for, but no sights or sounds of Cranes yet. Turning on to the main track that runs parallel to the river we were immediately struck by how much water there was; clearly due in part to recent heavy rain, although it’s also possible that flooding here is deliberate, with water being released from dykes, in areas that are designated for growing rice. We always have target birds for this site, but are always looking to add to it and hope for the unexpected and very quickly we had our first new addition. On the far bank of the river, in a clear patch amongst the reeds, a Night Heron stood perfectly still seemingly enjoying the warm sunshine. 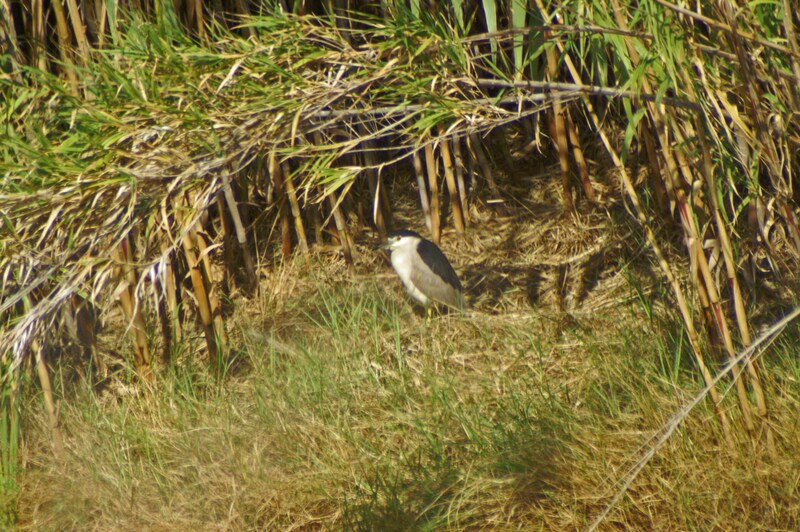 Looking closer we realised he was not alone, another one was close by tucked up in the reeds, about two thirds of the way up in the stems, apparently asleep – as Night Herons usually are in the daytime. 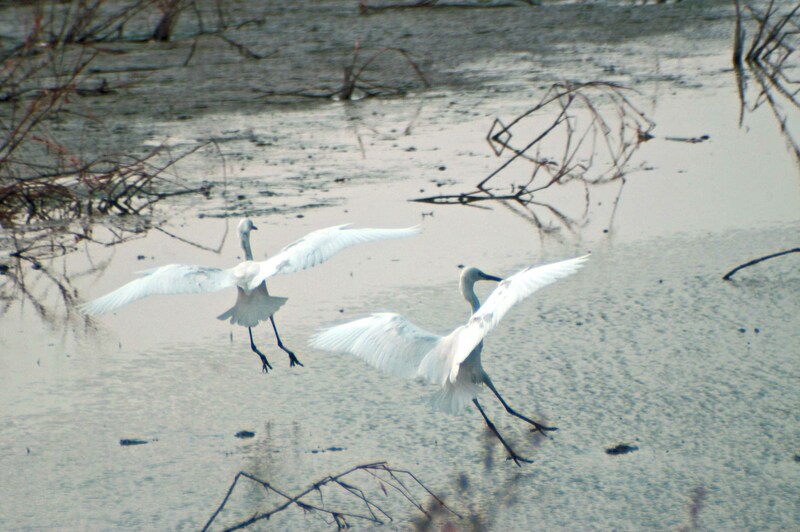 A short way past the Night Herons, in the middle of a flooded area quite a distance back, two Spoonbills stood in a resting pose, each balancing on one of their longs legs. 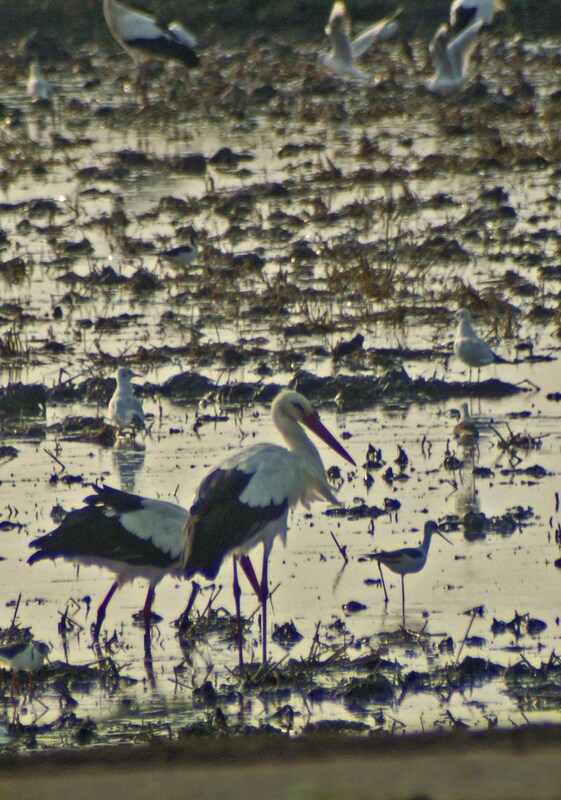 We drove on a little further as our attention was caught by the activity of a huge number of White Storks. As we got closer we realised that they were closely following behind a tractor that seemed to be turning over tracts of a stubble-covered field, exposing bare earth and it would seem, potential food for hungry birds. 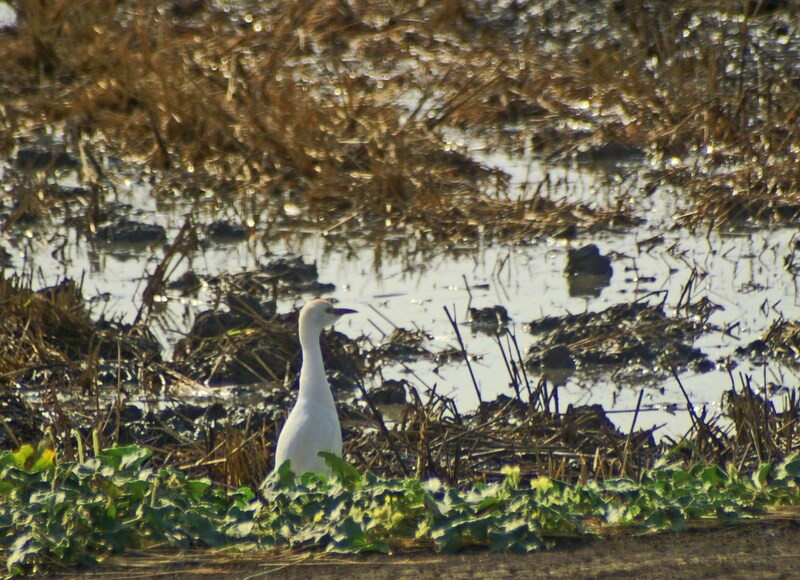 Soon Storks, Cattle & Little Egrets and Lesser Black-backed and Black-headed gulls covered the field where the tractor had worked. In the field behind this one were Cranes. 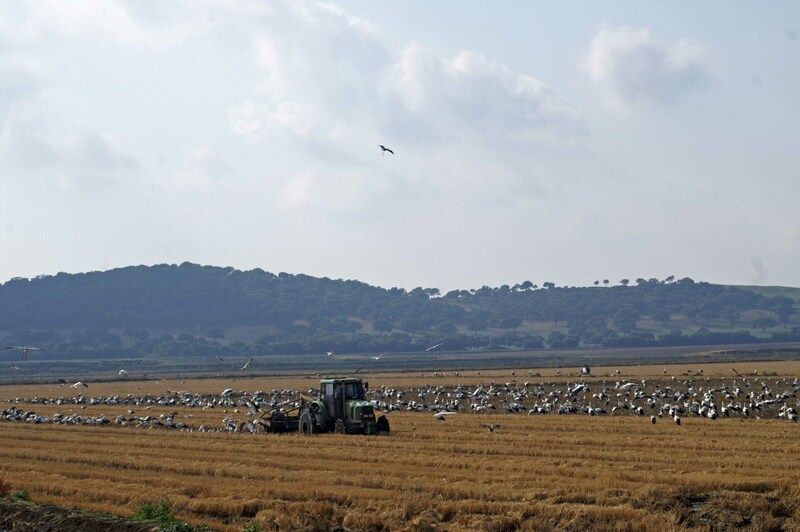 Behind them is the Cadíz-Malaga road and the sloping fields in the far background are on the coastal side with Zahara de los Atunes behind them. We had chosen a very bright sunny day for our trip, which was lovely to be out in, but reflections from standing water does hamper bird-spotting – and that’s our excuse for not spotting the Glossy Ibis sooner! Well, that and having been so enthralled by the Stork spectacle. Whilst we were engrossed in that, it seemed that a large flock of the aforementioned Glossy Ibis had been working their way towards us from the back of a very wet muddy field, heads down and very well camouflaged against the bare earth and the reflection of the sunlight off the water. 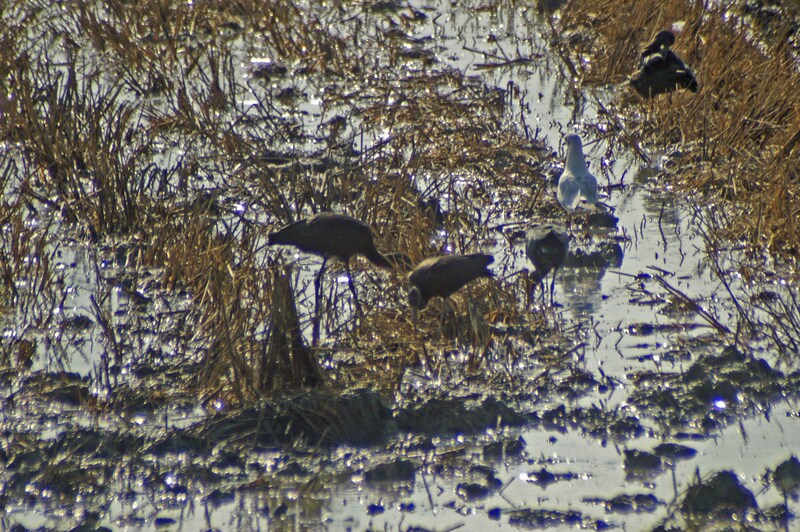 A small army of Glossy Ibis were methodically working their way up the length of the muddy field. They were very close before Jill realised they were they and pointed them out excitedly. 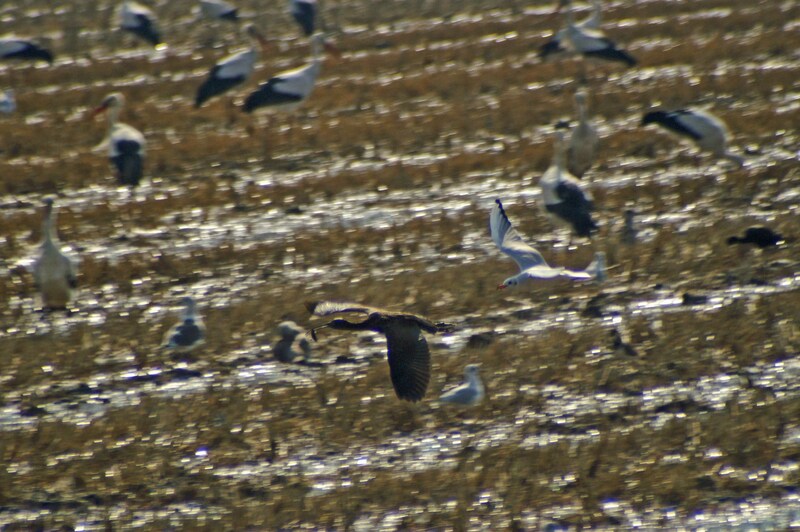 Some of the Storks had moved across to this field too and were joined by opportunistic gulls. 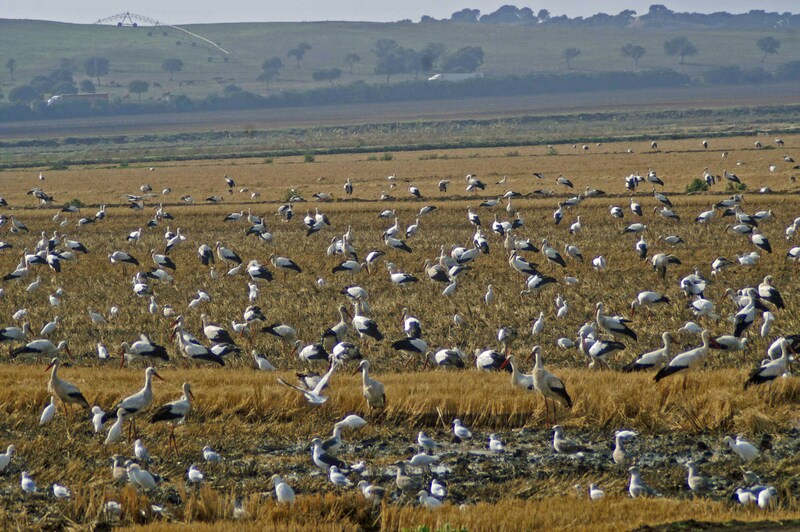 The increasing concentration of birds of differing species now at the end of the field heated up the competition for available food somewhat, and squabbles began to break out, mostly caused by gulls harassing Ibis. I caught a picture of a Black-headed gull chasing an Ibis in flight, with what appears to be a crayfish in its beak. 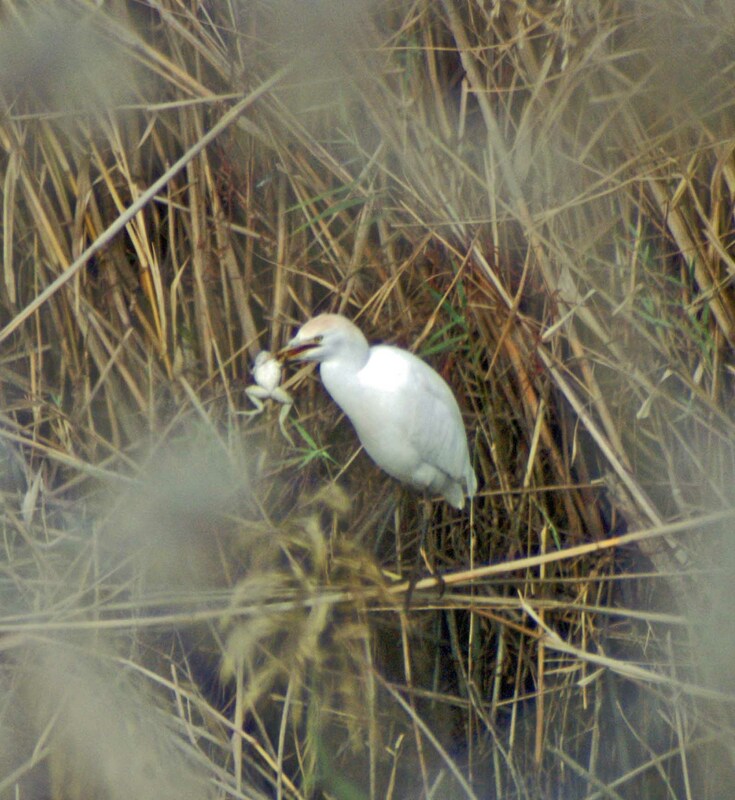 There were other hunters in the vicinity too, a Cattle Egret stalked the field behind a mud bank and secured himself a juicy frog which he promptly carried off to consume behind a screen of reeds on the far side of the river. 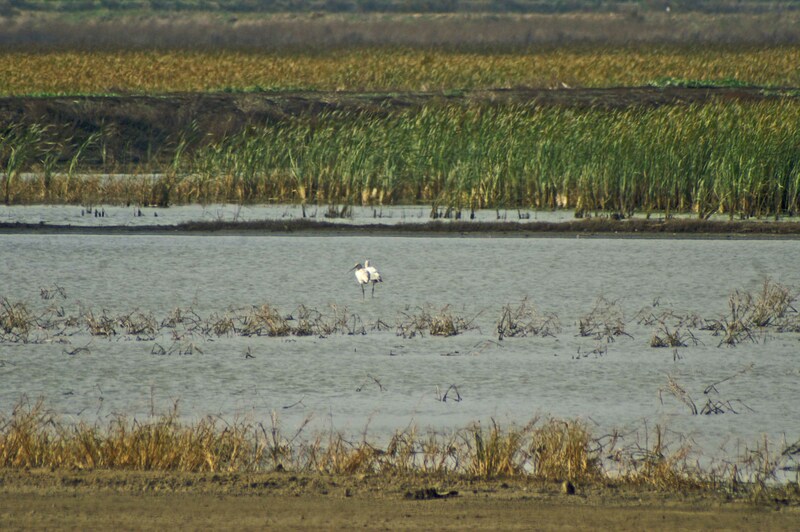 We had other sightings from our front-row spot in front of the Stork spectacle too; a lone Green Sandpiper foraged along the edge of the field, we had some distant views of a Marsh Harrier and a brief glimpse of a Purple Gallinule amongst the reeds of the riverbank. Two Corn Buntings landed on top of a bush by the side of the track and were joined there by a little Fan-tailed Warbler. 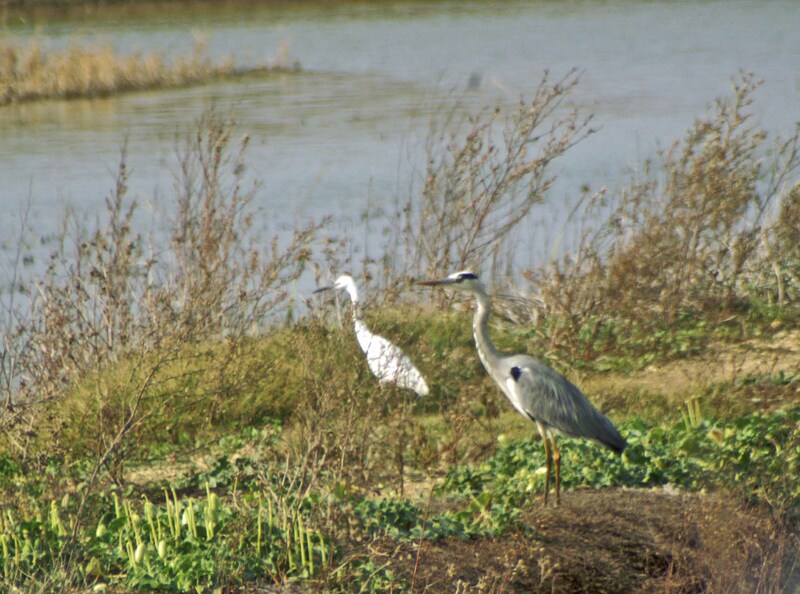 It’s amazing how time flies when you’re absorbed in watching birds! We suddenly realised that we had been in the same spot for an hour or more and had still only had very distant views of Cranes. 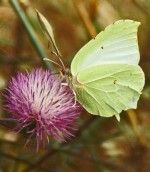 There had been no sign of the Black-winged Kite either, so we set off hoping to rectify that. 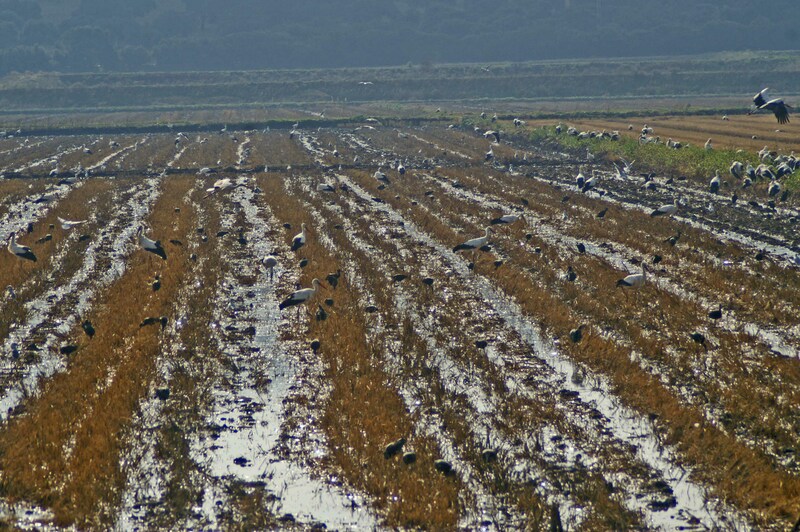 A flock of Common Cranes flew across the track in front of us and landed in a stubble field. 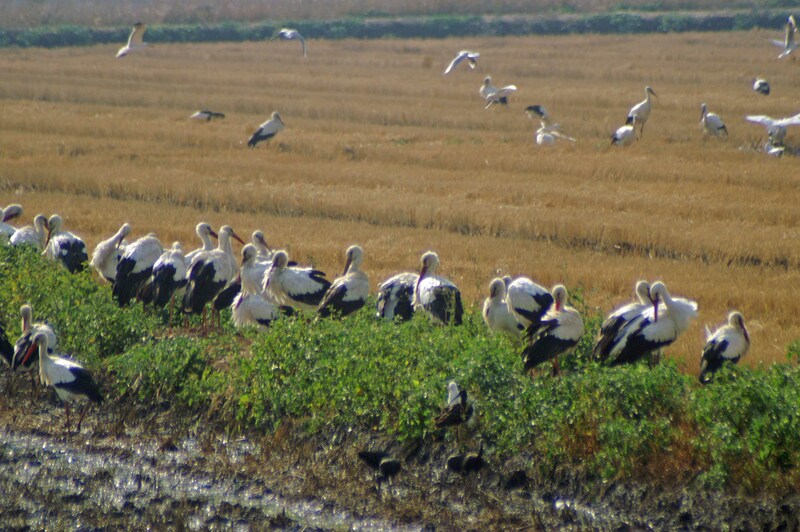 We didn’t have to travel far along the road before we had our Cranes – a flock of 14 birds flew low over the track in front of us and obligingly alighted elegantly in a stubble field. 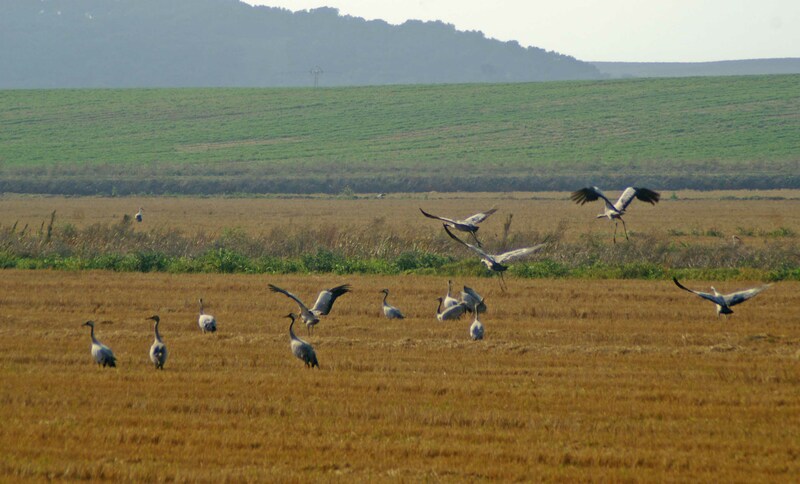 Common Cranes landing in a stubble field. They were a restless group as we have come to expect from these most charismatic and elegant birds, but their mobility and the wonderful noise they make actually makes them more interesting to watch. As often happens once you have your sight of a target bird we began to see more as we moved along, but although the first close sighting of a trip is the most exciting, you can’t have too much of a good thing and every sighting is a joy. 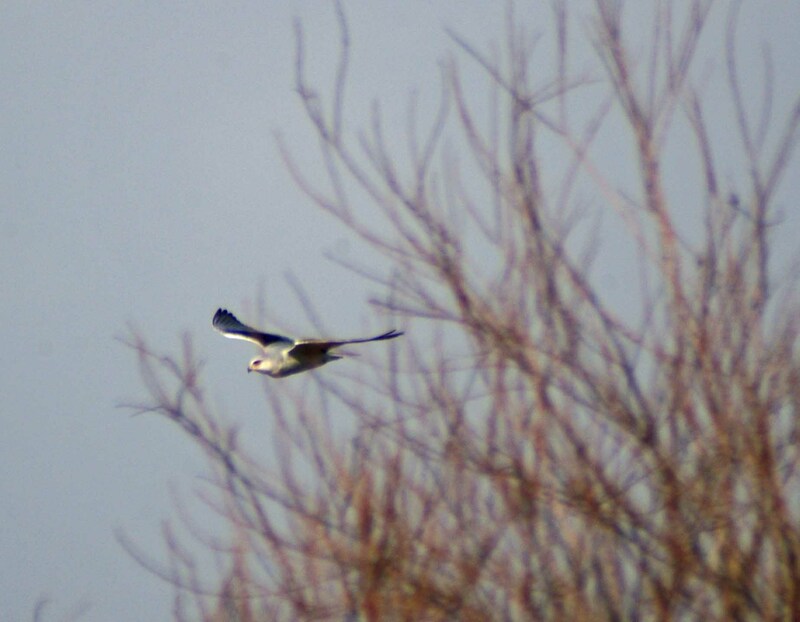 We had almost given up hope of seeing the Black-winged Kite, but then as we were driving along the straight length of track which has scrubby trees and vegetation on either side, we had it flying towards us and then excellent views as it flew past us. Our next significant sighting was as we stopped at the little bridge that crosses the river. We always stop here in the hope of seeing something on the water here, but very rarely do. 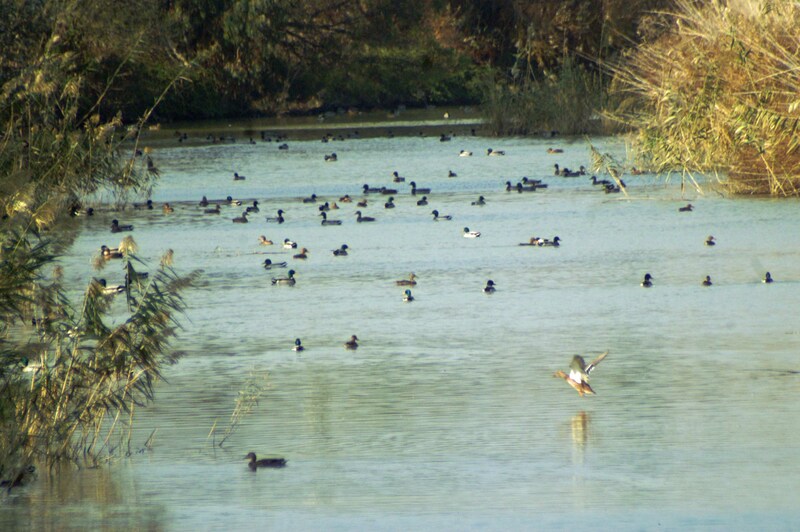 Today though the water level was very high and its surface was covered with Mallards. It was lovely to see them, but we hoped they weren’t planning to stay around to be shot at. There wasn’t much to see in the fields on the way up the hill to the farm buildings, just a few pheasants, usually dismissed by our more seriously ornithological friends, although I have to confess that I do love to see them, perhaps because they remind me of home. 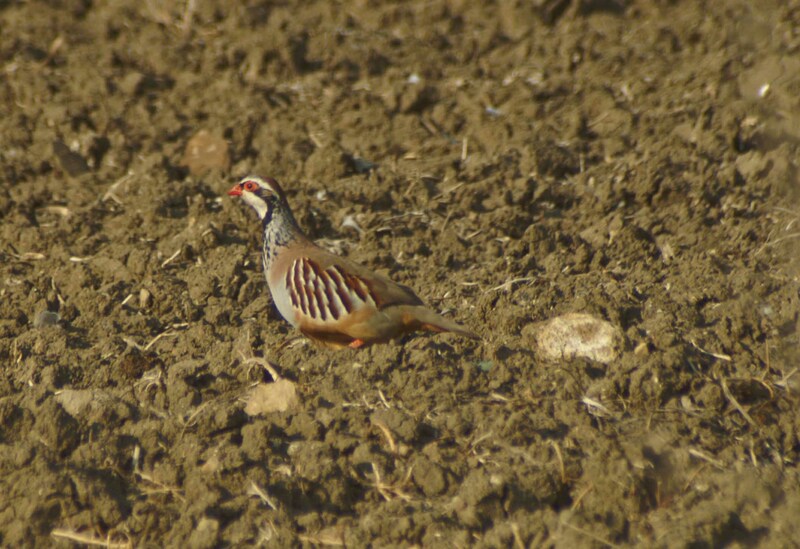 There was a more acceptable indigenous Red-legged Partridge too. On our way out of the site we were surprised to discover more flooded fields alongside the road that leads to the turning for Benalup de Sidonia. There were a lot of birds there too, more Storks with Black-winged Stilts amongst them looking tiny by comparison and lots more gulls, again a few Lesser Black-backed and Black-headed gulls. 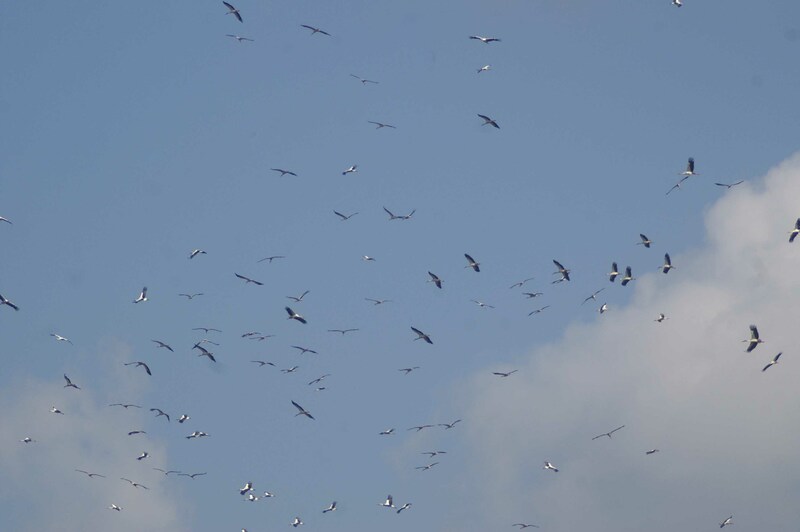 Our last sighting of the day was of a very large flock of White Storks wheeling around against a blue sky, perhaps seeking the thermal that will carry them to their wintering grounds in Africa. A wonderful sight to end another great day spent in a very special place.